Yeah - no catchy title for this post. I just saw a great post on The Badass Breastfeeder on Facebook that reminded me October is National Pregnancy & Infant Loss Awareness Month. I started scrolling through the pictures of the women and their stories, and I won't lie - I got too sad to keep scrolling. It's just heartbreaking to see some of their stories. And my emotions can only review so much heartbreak in one sitting. 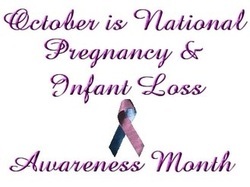 Statistics say that one in four women will experience a pregnancy or infant loss. I don't know whether to say it's 'good' news, but I'm surprised that statistic isn't higher. It seems like any time it comes up in conversation, I hear so many, "It happened to me," comments that I expected it to be even more than one in four. Because I lost two pregnancies, and that means at least three friends should have no idea what that's like, right? I'd heard years ago that miscarriages are more prevalant now than years ago. I wondered at the time if they're actually more prevalant, or is it just the fact that pregnancy is detected faster than ever? In my case, I had a loss at around 10 weeks, and another at just a few weeks. If we weren't trying to get pregnant, I wouldn't have been peeing on a stick to test so often the second time. If I hadn't even known I was actually pregnant, I just would have been late, right? So that one was a little sad, but I hadn't really settled into the idea that I was pregnant again yet. It made it easier to move on. Hey - if you want to keep reading my story, here it is. But it gets kind of gross. You've been warned. To backtrack to the first loss, though, it was a bit more of an experience. My Maggie (who is now 11 years old) was two-years-old at the time. I was pregnant again and we were thrilled. I hit the ten-week mark a few days before we were leaving for a Disneyworld trip, so we headed to the same midwife who had delivered Maggie to see if we could hear the heartbeat. She checked several times, and had me moving around to get different angles, but we couldn't find it. But I measured about where I should, and she reassued me that not finding the heartbeat didn't mean anything bad - we scheduled another appointment for after our trip, and headed on our way. Just before we arrived in Florida (we were riding along in my parents' RV), I started spotting. The first time I just tried to shrug it off, but we stopped for some pantyliners at the next drug store. As it kept up for a few days, I tried to call the midwife, but she was at a delivery out of the country and unavailable. I'm a very practical person, so I just went with the thought that whatever was happening, was happening. I didn't want to ruin my family's vacation at the hospital, and I knew there wasn't much they'd do if I was miscarrying so early. I enjoyed the trip as best I could, while following the pregnant lady rules (no rollercoasters or thrill rides). Since you already know the theme of this post, let's just fast forward and know that I no longer had a viable pregnancy. I wish it was really that easy. I spent all summer bleeding, sometimes spotting, sometimes too heavy to leave the house. Finally, after an all day trip to Indianapolis, I passed a hunk of yuck. Like, a chicken-breast size mass of tissue. I know, icky. Sorry. I figured the worst was finally done, although the doctor had finally scheduled me for a D&C in a few days. I'd be cleaned out and ready to start fresh. My body had other plans that night. I woke up around 2am or so, in a bed soaked in blood. I called my doctor's emergency line. He said if I was conscious, I should go to the hospital 10 - 15 minutes away that already had my records ready for the D&C. If I lost consciousness, hubs should take me to the closest hospital. Alrighty then. I arrived safely at the hospital I wanted to be at. We pulled up to the emergency entrance and I told the guard who came out to meet us that I was having uterine hemmorhage. He brought a wheelchair and got me to a triage room. I will never forget the kind empathy of the nurse who helped me there. She helped me onto the table and out of my pants. Then she chatted with me while she took my vitals (blood pressure was 60/40 by now), and then actually picked clots out of the mess between my legs. Bless her. If I recall correctly, I did bring them a basket of goodies the next week. I vaguely remember chatting with the doctor when she arrived after reportedly running several nearby red lights (thanks!). I told her I was still breastfeeding my oldest and would prefer not to receive any blood products. She looked at me like I was crazy, but said she'd do her best. For a very traumatic experience, recounting it actually doesn't really stress me out. The employees at the facility treated me wonderfully and respectfully. All of my wishes were met (well, except for the one about still being pregnant...). Everyone I met there did their utmost to treat me how I wanted to be treated, and I will forever be grateful that I didn't have anything else unpleasant to deal with, besides what my own body was dishing out. That miscarriage experience is what made my second miscarriage, after just a few weeks of pregnancy later that year, seem like no more than a blip on the radar. They say that babies who aren't born become 'angel babies' and wait for the next pregnancy. When Jack was finally born a couple years later, we always said he looked like a grumpy old man. If he had been the angel baby waiting through the last two pregnancies, that meant he was just watching us for almost two years. No wonder he was grumpy.